A lot of leader conversations I’m having these days center around the concepts of innovation, creativity, and ideation. 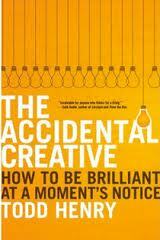 The past two days’ posts here and here dealt with the concepts found in the book “The Idea Hunter.” Continuing in the same vein but with a little different focus is the book “The Accidental Creative” by Todd Henry. To attempt to be perpetually brilliant and increasingly productive, without changing the basic habits and structure of your life to accommodate that undertaking, is a futile effort. Henry develops the following elements as a structure to guide your creative potential, providing you with the stability and clarity to engage your problems head-on. Practices in each of these five F-R-E-S-H areas provide the foundation for a life that is prolific, brilliant, and healthy. Wait a minute – you’ve got a problem with the “creative” label? Call yourself anything you want, but if you’re responsible for solving problems, developing strategies, or otherwise straining your brain for new ideas, you are a creative – even if you end up being one accidentally. This entry was posted in Brand You, Innovation and tagged Brand You, Creative, FRESH, Innovation, The Accidental Creative, Todd Henry. Bookmark the permalink.